Bertmans serves delicious, healthy, fresh food, beautifully prepared, in a nicely designed setting. Their menu is mostly vegetarian and vegan, but if you go here without knowing this, you probably won’t even notice the fact that there is hardly any meat on the menu. And that is exactly what their philosophy is all about. Even though the interior is absolutely gorgeous, I prefer to sit outside, by the water, preferably on a sunny Sunday, enjoying the laid back vibe and a nice breakfast with toast, poached egg and avocado. For later in the day this is also the place to be for a drink, especially if you are fed up with snacks like nuts or ‘bitterballen’. The selection of (healthy) snacks at Bertmans is really good! The polenta fries are a must try. Bertmans is also open for dinner, something I haven’t tried yet but it must be equally delicious. 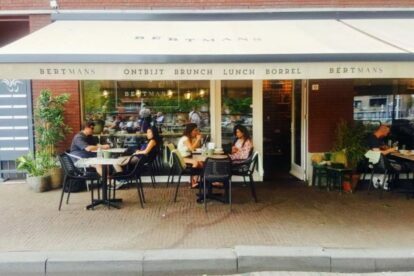 Bertmans recently opened a new, gigantic, and really pretty restaurant more centrally located on the Schouwburgplein. A good option if you are in the area, but I do prefer the smaller one more north of the city, by the water.